For lunch, I had tacos al pastor at a taqueria near work. There’s loads of meat to choose from and at $1.50 each, they’re cheap and tasty! Tacos al pastor, with chopped onion, cilantro and served with a lime wedge and turnips. The soft tacos are usually made from corn or wheat, and each taco you order at the restaurant typically has not one piece of taco, but two. Pork is marinated in a combination of dried chiles, spices and pineapple. In some places achiote is also added, and then slowly cooked with a gas flame on a vertical rotisserie called a trompo (lit: spinning top), very similar to how shawarma is cooked, with a piece of fresh onion and a pineapple on top. The juice from the pineapple contains bromelain, an enzyme that breaks down protein and thus makes meat tender. When ready, the meat is then thinly sliced off the spit with a large knife. It is served on small tortillas, with finely chopped onions, cilantro, and occasionally, a small slice of pineapple, and usually topped with some lime juice and hot salsa. Forgive Y&H’s obsession with tacos this week, but I’ve been fascinated by the wealth of history behind this simple Mexican street snack. Take tacos al pastor. Many taquerias don’t prepare them the traditional way, which requires a vertical rotisserie like the ones you see in shawarma shops. In the video above, Nicholas Gilman explains the presence of these spits in Mexican taquerias. They’re legacies, it seems, of the Lebanese natives who brought them to Mexico in a wave of immigration in the mid-20th century. 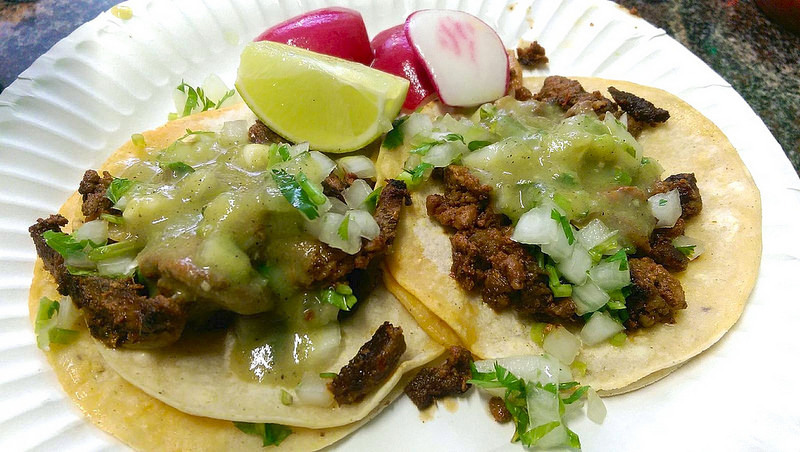 Mexican taco makers merely adapted them to a meat more common in Latino cuisine. Not that I don’t trust Mr. Gilman, but I wanted to do some fact-checking on this page in culinary history, so I turned to Mark Miller’s excellent cookbook, Tacos. Miller, if you’ll recall, is trained both in anthropology and cooking. The father of Southwestern cuisine, Miller founded the Coyote Cafe in Santa Fe and the late Red Sage in D.C. The meat for these “shepherd’s” tacos is commonly seen roasting on vertical spits displayed with pride on street stands throughout Mexico. The spits are usually topped with a pineapple, which is thinly sliced and served in the tacos. This method of cooking meat is identical to that used for the spit-roasted lamb (shawarma) brought to Puebla, Mexico, by Lebanese immigrants in the 1930s. The technique was copied by the Mexican taqueros (taco masters), who substituted pork for lamb. The original stand for tacos al pastor still exists in Puebla, with vertical spits of pork still revolving in front of its huge wood-burning hearth.